TOYS! Dave and Sid talk about some recent action figures they’ve purchased. Dave talks about recently getting into collecting figures. We also chat a bit about video games and video game players using the service “Twitch” to stream themselves playing games on the internet. Recorded January 25, 2018. 30 minutes. Twitch – a community where millions of people and thousands of interests collide in a beautiful explosion of video games, pop culture, and conversation. Dave fills us in about how he wants to be less responsible for 2018. Sid talks about trying to be authentic in business and in life. We live-streamed this Podcast session. Watch it in living color! 079: We are back! Let’s catch up, shall we? Happy 2018! Where has the last year gone? We have regrouped and it’s time to play catch up! Sid fills us in on his new studio location and what he’s been photographing lately. Dave tells about his virtual co-working space and how 2018 is going to be a year of being less responsible. Happy 2017! Dave and Sid talk about their impression of Rogue One (warning: spoilers! ), and move on to discussions of what was good in 2016 that is carrying them into 2017. Recorded Tuesday, January 3, 2017. 45 minutes. Broadcast live on YouTube from Dave’s living room, Dave and Sid talk video games for 30 minutes. Recorded Monday, September 12, 2016. 30 minutes. Video available on YouTube. Broadcast live on YouTube from Dave’s living room, which is now reconfigured to resemble a coworking-friendly cafe. We get caught up on Sid’s big stressful studio move, Hasselblad digital backs, dealing with uncertainty, local eats, losing weight, and tentative plans for our podcasting future. Recorded Monday, September 12, 2016. 30 minutes. Video available on YouTube. 075: HAPPY NEW YEAR! WELCOME 2016! WELCOME STAR WARS! It’s Monday, December 28, 2015! Happy New Year! Happy Star Wars! Star Wars Spoiler-Free Impressions. Our reaction, comparisons. Happy Holidays! Topics cover the new Broad Street Parkway providing direct access into Nashua’s downtown Mill area, video games of a massively multiplayer nature. Sid talks about his new kitties and the experience of financial planning for house hunting. 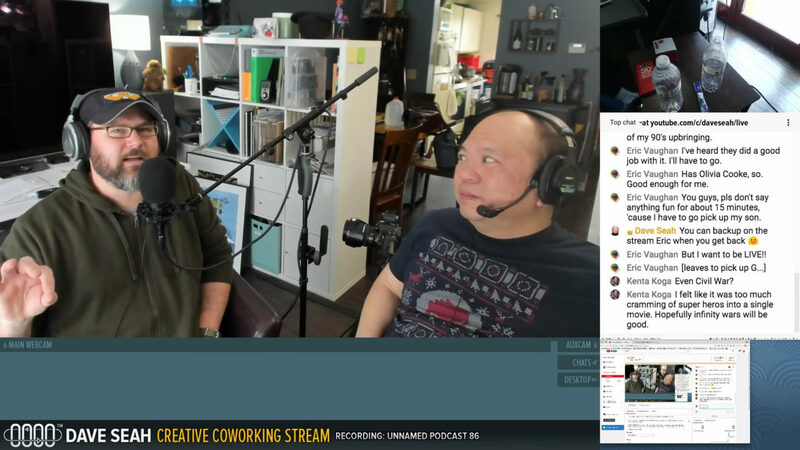 Dave talks about progress on his Living Room-to-Cafe conversion, creativity and motivation, and finding some game nerds to hang with. Recorded Tuesday, December 07, 2015. Shadow of the Colossus (video link), developed by Team Ico, a studio making games featuring emotion connection. Instant Chocolate Porridge in a cup! MakeIt Labs reopening in new space. Happy Holidays! After a long hiatus, Sid and Dave are back! Sid talks a little about a local wood worker who made a custom camera part for him. Dave tells us a little bit about his recent month long trip to Taiwan. Recorded Tuesday, November 23, 2015. 45 minutes. In this extra-long episode, Sid and Dave discuss their reaction to summer blockbusters Avengers: Age of Ultron and Mad Max: Fury Road, followed by a quick recap of all movies playing. Sid talks about his dad’s green thumb, flea market finds, and spiral-cut hot dogs. Dave talks about his dad’s visit, his fancy tomato planter, and upcoming trip to Taiwan. Recorded July 7th, 2015. 60 minutes. Swirly Hot Dog cooking – amazing! Dad is Visiting and Living Room Cafe Updates.